These are tips I use/used when buying so its just my personal opinion ( ´ ▽ ` ). When I was in the states I bought from Tamaya which is an authorized san-x shop of the USA (they get shipments straight for san-x but a month behind). You don’t need to worry about fakes so long as you are buying from Tamaya. Tamaya charges about $23 per plushie which given the current exchange rate of the dollar and yen is almost the same as Japan’s (A little higher). If your not in the CA area you can also order them at Tamaya’s Ebay or Amazon store. If your not fluent in Japanese have no fear all you really need to know are these words リラックマ(which is Rilakkuma) ぬいぐるみ(plushie) click here and its already done for you. I’m working on putting a list on here of Yahoo Auction Pages to check but if you have a series you want and don’t know the Japanese name send me a comment and I’ll help you! poohlover_1217– sells Rilakkuma in lots, keep checking back! For this site though you will need a Japanese credit/debit card and they don’t ship internationally. You can also use courier companies in Japan or in your own country that will help you bid on these sites and ship to you. But be careful , really do your research and read lots of reviews(compare prices too). Tenso works well with San-X. This site is really good to use, you don’t need a Japanese card, though they don’t ship internationally. I really like the san-x net shop because you can get the items right when they come out. But the down fall is things sell out super fast! Lots of people have been recommending this site to add on here! It’s looks pretty good, and prices are pretty decent since she’ll ship almost anywhere I say this is a great place to check out! She has a good collection of old and new. This is where is gets a little scary, there are so many fakes on ebay. So really look at the pictures and tags. But I’ve found a seller that works hard to bring you real Rilakkuma plushies and also might help you find a specific plushie! xxmiraixx– she has a wide variety and only sells real plushies. Pro: she always has rare one’s and sell other San-X stuff. Con: She is kind of pricey but you have to weigh how much you want the plushie vs how much it costs. Yahoo Japan Auctions usually sell stuff cheaper but if you have to get a courier service you’ll have to pay fees and it might just be easier/cheaper to pay a little extra on ebay. Richelle’s e-store– I’ve bought a plush from her store and it was perfect, keep an eye out for more from her kawaii shop. Canadian seller. Have a tip? Lets add it to the list. 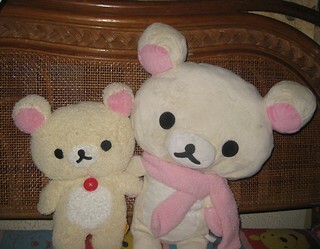 How to Spot the Fake Rilakkuma?? Like every other Brand name there are knock offs of the kumas too…..now there’s nothing wrong with those so long as you know that’s what your getting. But when people claim that’s a real one you need to make sure you know how to tell if its real or not. So your looking for the REAL brand name Kumas eh? Well I’m here to help you the best I can. First thing to do is look at the Plush. Does it look like something might be off? I’ve always preferred to play it safe if it looks off I won’t buy it (better safe then sorry). San-x works extremely hard putting so much detail into ever plushie, so they wouldn’t make them look wonky. Not sure what real ones look like? Check out these official sites to get a feel for the real ones. Tag Art/ Pictures should always match there series. Tags should always have a bar code on them, always have the prices in yen listed on the front and the back of the tag should be in Japanese. Usually tags are square on the 22cm but come in a few other cute shapes (not circle). Fur is very soft looking too! Fun Fact- All real Rilakkuma plushies have zippers and all Korilakkuma plushies have one red button on the front of her! The Zippers that open up on the back are lined with blue polka-dot fabric on the inside. UFO Catcher one’s usually don’t open but the Small 22cm ones mostly do. Notice the fastener attached to the label which is attached to the side of the leg. Bar code/Japanese price/San-x/Art matches series. It should look like this all the pink rilakkuma labels have the tags attached to them by fasteners. Kiichan doesn’t have legs so the label is always on his LEFT side. Fake, Fake, Fake…Why? They all look wonky(bad or shaped weird)/weird fur/tags are on the ears. Also the more you look at the real ones you’ll notice the clothes are wrong and not released that way. Remember San-X doesn’t take short cuts so plushies should be symmetrical. I find the UFO Catcher one’s a little more challenging. FansClub is the main (maybe the only) company to release the UFO Catcher Plush with san-x’s permission. They come in all sizes so don’t be discouraged by that. Head on over to their site where you can check the archives. It’ll come in handy when you find one you want. The same tricks can be applied to tell but the tag is a bit different. Tags are always fastened to the label on the side of the leg which say Rilakkuma in Japanese and San-x. They are shaped in a circle, don’t have a bar code/list Rilakkuma in Japanese and have only Japanese on the front. The art on the tags are usually just plain (no one’s dressed up). The best way to be 100% sure is look at the back of the tag which should be all in Japanese, have a San-x logo/Fansclub website. If you find a seller ask them if they’ll take a picture of the back of the tag and show you. If they won’t better to not take the chance. This is what the real one’s look like on the back. All real, straight from FANSCLUB. But no tags are show. Still you know whatever they released and what they haven’t. Never saw this release on the site/tag is attached to the hand….also can’t see back of the tag. Pretty tricky huh!? So for this one I’d say not real. I hope this leaves you more informed and just remember to be careful! Any questions or helpful tips I gladly welcome. No one should ever be scammed again! Also check out Faith & Mary’s blogs, they are real rilakkuma hunters too and have great guides on the subjects! I would love to suggest harukata on ebay. This seller always provide awesome packaging and he even give you the original san-x plastic bag – which will makes you buy the item at the store by yourself 🙂 The price are kinda OK but the bad thing is the shipping fee is very pricey as he only offer EMS as the shipment. Overall, he is a very great seller! Are you offering your bidding service or no? O: I would love to use your service!! Yes they are ha ha I saw that auction before. But it’s an auction with 3 days left. If you want I can bid on them for you and you can tell me your maximum bid your willing to pay. But prices do tend to sky rocket the last day or last couple of hours >< I always hate when that happens. You can email at avengers_assemble2010@yahoo.com then I’ll have your email and update you if we win or lose or get outbid. Hello! If I use your service for buying at the real Rilakkuma Store, will you charge any travel fees? If you do, may I know how much is it? Please reply this comment as I don’t check my email so often. And also, which converter do you prefer to use for JPY to USD? What would you be interested in getting? Haha that’s very kind of you to say, yeah I’m just doing this to help people more than to make money. I always wished someone had done this so I decided to do it myself. Also, do you help with the limited edition sets? I was hoping to ask you for help in getting the Rilakkuma Wonderland plush set that will release on July 13th. It is great that you are doing such a great thing to help the fans of San X Rilakkuma get items that cannot be bought outside of Japan. That is so sweet of you!! Please keep up he good work! My email is Chingsui2002@yahoo.com Thanks a lot!! Actually, I don’t want to get them anymore since I just did a conversion from the Japanese to American dollars and did not realize how expensive it was. No wonder none of them had bids. Thanks anyways! I just need help in getting the Rilakkuma Wonderland floats set that will be released in July. Thanks a lot! Do you happen to know where I can find the shipping cost? I was thinking of using a bidding/buying site but I am trying to figure out how much the total cost would be after shipping, service fees, etc. And I forgot to ask, how much would you say the average cost for the UFO Catcher ones be? Well I would say never go over $10 each or if they’re really cute and on your wishlist don’t pay more than $15…..most people sell them for 500yen each or less. Like the second link is 700 for both it’s a nice deal. So it looks like no one is selling the bedtime one’s right now~ But don’t worry I usually check daily so if I see them I’ll let you know, they’re on my wishlist but they’re not high priority so I’m not looking to get them for myself just yet. I’ll send you a link when I find them but they can get expensive sometimes! I found Korilakkuma from the Bedtime series here…. I was checking everywhere but Taurus is really popular and sold out. You could also wait for a better offer to come around but sometimes it’s hard to wait I know XD. Let me know what you decide to do but I’ll keep an eye out for more Taurus plushies~Best wishes on your hunt! I’m glad you could get it and not a bad price~ did you use Tenso or another buying service to make the bid? Do I need a japanese credit card to pay? I don’t have one :(( hahaha sorry again!! Hey Annie, Hmm I thought Tenso took care of bidding and dealing with the seller. Did you make your own account? You can email me here arielinkawaiiland@gmail.com and I’ll try to figure out what you need to do! Have you asked/emailed Tenso or have they told you what to do at all? hi i just bought a taurus rilakkuma plushie,but im nt sure if its real or fake? other than that,the tag itself is real (yen price/jap words) but its attached by a fasterner on the legs. does ALL authentic rilakkumas has the blue polka dots cloth in it? the fake ones wont have it? I’m sorry about that, but yes always the inside is blue polka dots because that’s his trade mark. Some zippers aren’t real so you can’t open them but most of the time the zipper is real. This is more for older series~I hope you can find a Taurus one soon! thanks for ur help,i hope to find it soon too hehe 🙂 ! Thanks for the kind offer, I live in Japan too! This is currently my two koris that I recently bought. Hello there, I would need to see the tags to be 100% sure but they both look kind of off so I don’t think they’re official Japanese versions. There is a fansclub one wearing a pink scarf I believe and a fuzzy mini one. I’ll try to find some pictures for you so you can see the difference~ But that being said they’re still cute and as long as you didn’t pay the authentic prices there isn’t any harm done. May I ask where you got them? Dear do you still do bidding for yahoo auctions? Hello! I love your blog and I use it to keep on top of all the Rilakkuma news 🙂 I have been trying to find the Tower Records Koiritorii from like a year ago, the one with the green mohawk, for my friend. Any suggestions of where to look? Any help would be appreciated. Thanks! Hello there I would suggest using Yahoo Japan Auctions! If you need a buying serice as they don’t ship overseas then Tenso is a great choice!! Hi, i’m really in need of the Rilakkuma Sky Tree memopad (the white one). Do you have it or know where I can get it? I’m in US. I don’t really need the entire memo pad. I’ll be happy with the sheets only. I don’t know where exactly you could get that maybe Kawaii Gifts would have it, they’re in the US as well! They are really really cute especially with the flowers. As far as I’ve researched, I don’t think San-X released any similar series. Is there anyway I can know if, at least, the bears are authentic? As far as I can tell I haven’t seen them as an official Japanese release but still doesn’t mean you can’t get them ^^ They’re very expensive for non Japanese releases though so if you come across a cheaper one it would be better!